The People or the Steeple? Designs among Catholic churches in the post-Vatican II era have been diverse. These changes have evoked strong opinions in both those advocating newer styles and those desiring a traditional approach to church design. Objective inquiries into this issue have been lacking since the council adjourned in 1965. Filling this data gap in the discussion requires empirical studies about how Catholic church design affects the faithful regarding prayer, devotion, and other communal factors. Throughout Catholic history, church structures have prompted worshippers to bond with the sacred by evoking feelings of devotion, transcendence, and prayerfulness. This bond can promote a distinct form of place attachment; a religious place attachment. However, some congregants may say that their church “doesn’t feel like a church,” seems “too old-fashioned” or “doesn’t speak to me.” Evidently, a strong religious place attachment does not appear among some congregants. Is there a measurable link between a church’s design and the parishioners’ worship experience? Do traditional churches really enhance a person’s prayer life as many supporters purport? Most importantly, can congregants’ spiritual lives be influenced—either heightened or reduced—by modern church design? Answers to these questions require investigations into the relationship between Catholic church buildings and their worshippers. For this purpose, our study examined two Catholic parishes from central Illinois. These churches were matched on physical size, congregation size, and ethnic composition. 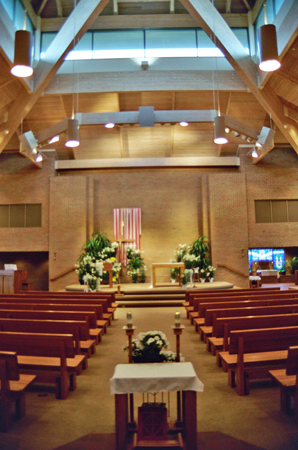 The study examined design features that satisfy or dissatisfy worshippers who attend Mass at a traditionally designed Catholic church (parish 1) and a modern Catholic church design (parish 2). Congregants’ preferences for traditional and modern design features, sacramental and functional design features, and communality were all examined. Ours is one of the first studies of its kind and presents a prototype for research that can be replicated elsewhere. The exterior of Parish 1 features a rose window and a traditional bell tower, while the interior is articulated by a wooden beam roof and traditional iconography. 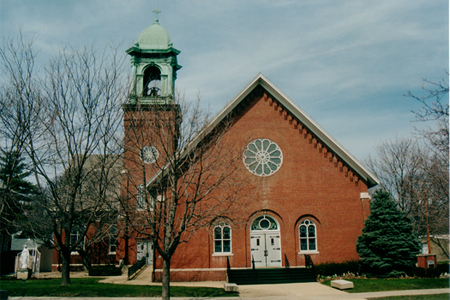 Parish 1 is a traditional Romanesque-style church built in 1903. It has a longitudinal plan with a composition centered on the altar and Eucharist. It has many original stained-glass windows depicting various saints and Eucharistic symbols. In addition, frescoes adorn the marble-clad sanctuary. The tabernacle is elevated slightly in the sanctuary and aligned on the center axis of the church. 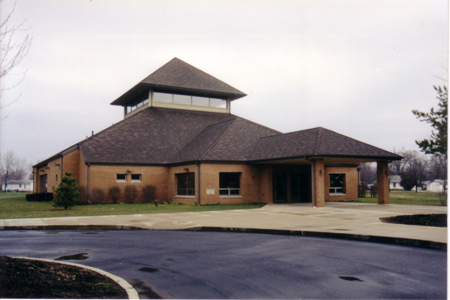 Constructed in 1996 in accordance with Environment and Art in Catholic Worship, parish 2 lacks a historical style. EACW was a postconciliar statement from the US Bishop’s Committee on Liturgy that served as a foundation for many church designs in the post-Vatican II era. In contrast to the basilica plan of parish 1, parish 2 is laid out in a fan shape. The tabernacle is in a separate chapel/nook detached from the sanctuary. In front of the chapel and removed from the altar are the chairs for the priest and deacon. The choir area flanks the other side of the sanctuary opposite the tabernacle (not in a balcony behind and above the worshippers as in parish 1). In comparison to parish 1, parish 2 has minimal décor and iconography. A baptismal font for semi-immersion is located near a spacious narthex that doubles as an entry and gathering area. Our analysis of survey data from parishioners at both parishes uncovered several fascinating findings. An exploratory factor analysis revealed four factors of related design characteristics. Each factor represents a group of what parishioners believe to be interrelated  design characteristics of a church. The first factor is “Environmental Quality.” Design characteristics that were related in this group pertained to the quality of the floor, wall, ceiling, pews, and overall environmental quality of the church. Parish 2 parishioners were more satisfied with their church in this category than were parish 1 parishioners. This may be attributed to parish 2’s relative newness (only six years old at the time of the study). The second factor, “Spatial Quality,” contained items that pertained to the quality of gathering spaces, accessibility for the disabled, security, and spaciousness. Parish 2 garnered the most satisfaction for these characteristics. 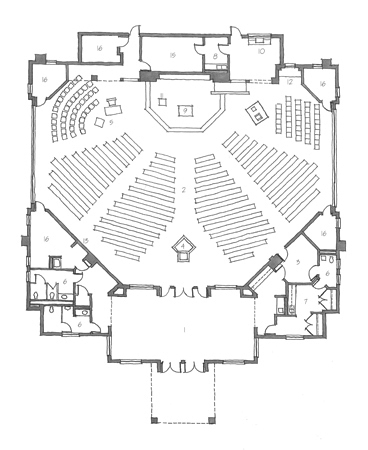 Many parishioners found the rather large gathering area/narthex in parish 2 was very desirable. The traditional church had only a small vestibule area that served as the narthex. Parishioners would gather outside after Mass, a source of dissatisfaction for several parishioners during inclement weather. The third, “Preference for Sacramental Design Features,” contained items that pertained to the preference of paintings, statues, tabernacle placement in the center of the sanctuary, and stained-glass windows. Parishioners at the traditional parish were more satisfied with their sacramental design features than were those at the contemporary parish. What might account for the higher satisfaction in parish 1 for the sacramental design features? The unique design characteristics of each church provide some possible explanations. 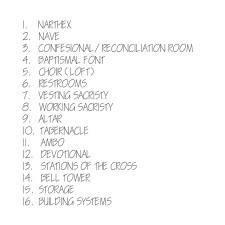 Parish 1 sets up a hierarchy of forms within the building with a linear axis culminating at the altar and tabernacle area. Thus, a parishioner’s sight focuses on the mysterious and sacramental nature of the Eucharist. Parish 2 places more emphasis on the meal aspect of the Eucharist and set up the altar as the main focal point of attention in the nave. The design of parish 2’s altar is more table-like as well. Overall, the design of parish 2 encourages communality among congregants coming together for the Eucharistic “meal.” However, tangible reminders of the mystical community, or rather the Communion of Saints, are lacking in the design and iconography of this church. 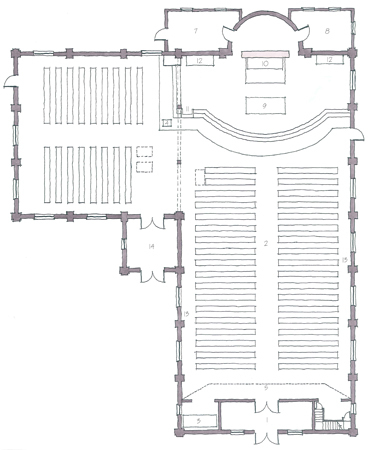 The fourth factor, “Paschal Mystery Design Features,” contained questions reflecting the appearance of Paschal Mystery themes in the sanctuary, tabernacle placement, and crucifix location. These characteristics were favored significantly by parish 1’s congregation whose building centered more on the mystical aspect of the faith. For example, parish 1’s sculpted Stations of the Cross were noted by parishioners when commenting on this theme. In both parishes, the Paschal Mystery ranked in the top three religious concepts that a Roman Catholic Church should reflect. At parish 1 it ranked first. In both parishes, though, there was clearly a desire among the faithful to see the Paschal Mystery reflected in the iconography and designs of their church. At parish 2 this theme is best played out in the Stations of the Cross, which although abstract in design, were still important to the faithful. The exterior of Parish 2 includes a covered entrance; the interior has natural light from the clerestory windows above. Our study also explored the parishioners’ overall connection or religious place attachment to the church building and parish. Parish 1’s congregation expressed a deeper, more prayerful connection to their church building than did members of parish 2. This church/religious place attachment prompted worshippers to bond with the sacred by evoking feelings of devotion, transcendence, and prayerfulness. Several reasons may account for why parishioners at parish 1 had a deeper religious place attachment with their church. The visual styles of the parishes are different. 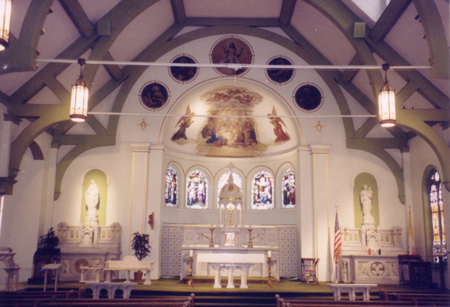 Parish 1 consists of a traditional arrangement and furnishings that adorned the interior. By contrast, parish 2 has a stark minimalism and lack of iconography and sacramental architecture that may have failed to inspire. The Christian faith has long held that God reveals himself through sacramental architecture, since perception limits worshippers to objects that they can experience directly through the senses. Iconography can materialize Catholic beliefs and provide a window to heaven for the believer. Several open-ended comments from members of parish 2 indicated that a prayerful inspiration was induced with the addition of the Stations of the Cross  and a statue of the parish’s patron saint in 2002, six years after it was built. Connection among parish members was equivalent for both churches. This was unanticipated as it should follow that with parish 2’s explicit attention to community in its design intent, there would have been a higher connection between parish members. For instance, the church is more accessible to the disabled and elderly, has larger interior gathering spaces, and has a fan-shaped arrangement of pews and visual focus on the altar consistent with “communal” design. But, based upon the results of our study, these features might not inspire a communal feeling above and beyond that which a traditional pre-Vatican II church already offers. This finding suggests that churches may not have to conform to design ideas such as those set forth by EACW in order to encourage community among parishioners. The results of this study should cause us to reconsider how parishioners perceive their churches and how architects should design, restore, and renovate churches. For example, it is apparent that the Paschal Mystery should play a vital role in the design of a Catholic Church. Parishioners’ desire to reinforce community should not preclude the prayerfulness evoked by designs reflective of the Paschal Mystery. Religious place attachment can foster the faithful’s prayer life and a sense of community (e.g., Baptism, First Communion). Parish 2’s primary emphasis on user-friendly design and communality may have facilitated relationships among church members, but not to a greater extent than in parish 1. Moreover, it appears that parish 2’s church did not facilitate a personal or communal relationship with God and the mystical body of the church as much as the design of parish 1. Parish 2’s diffuse placement of sacramental design features throughout the church might encourage congregants to focus on other parishioners and not as much on the character of divine sacrifice and otherworldliness found in the Eucharistic celebration. Overall, this study seems to indicate that traditional churches designed to house God may well foster communion with God and, in turn, other congregants. If future empirical research studies indicate similar findings, then leaders within the Roman Catholic Church could benefit from a reassessment of what they ultimately intend their churches to communicate and what kinds of designs may strengthen or weaken parishioners’ religious place attachment towards their church. Seemingly harmless alterations like the placement of a tabernacle or removal of iconography to limit “distractions” could influence congregants’ perceptions of the Eucharist, and, therefore, the foundation of Catholic ideology and identity. Kevin C. Manning is an architect in the office of Jaeger, Nickola & Associates, a Chicago architecture firm specializing in church design. Dr. Nicholas J. Watkins is Director of Research & Innovation at Hellmuth, Obata, and Kassabaum (HOK). Dr. Kathryn H. Anthony is a Professor in the School of Architecture at the University of Illinois at Urbana-Champaign.